Saeb Erekat: Obama dares to threaten us. 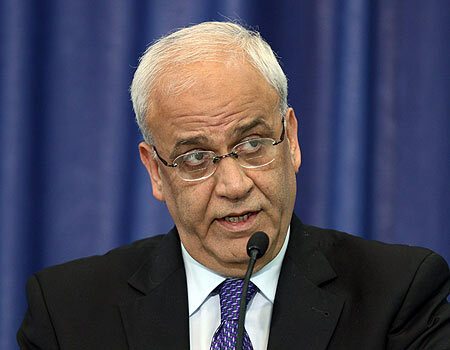 The United States has warned it will cut aid to the Palestinians if they proceed with a unilateral bid for statehood at the UN in September, chief Palestinian negotiator Saeb Erekat said Friday. Erekat said the US Consul-General in Jerusalem, Daniel Rubinstein, told him Friday that the US will take “punitive measures” if the Palestinians proceed with seeking UN recognition of statehood. The US consulate said it had no immediate comment. The Obama administration’s ‘dealing with Israel group’ is headed by The Jihadist At 1600™ himself, Cass ‘Nudge’ Sunstein, Hillary ‘Who’s Vince Foster ?’ Clinton, Harold ‘ICR2P’ Koh and Samantha ‘Invade Israel, I’m Mrs. Sunstein’ Power. Not only will that genocidal-maniac-sympathizing-and-supporting bunch not cut any aid to the peace lovers, if anything, they’ll increase America’s contribution and participation in the takedown of Israel and annihilation of The Jewish People. Was gonna take the night off from looking at news, but instead, it looks like I took a wrong turn at Albuquerque. This entry was posted on Friday, August 26th, 2011 at 21:48 and is filed under Main Postings. You can follow any responses to this entry through the RSS 2.0 feed. You can leave a response, or trackback from your own site.